With next week’s two-night crossover with Arrow and The Flash, a slew of promotional photos for the event were released and teased the legendary crossover that will set up the third DC superhero show on The CW, DC’s Legends of Tomorrow. But among those photos were a few – and one in particular – that left me feeling all the feels. And no, it wasn’t an Olicity picture. It was a picture of Barry Allen and Felicity Smoak embracing during their reunion in this year’s crossover. One of the immediate thoughts I had was – besides my entire being going “aww” – was that this photo proves more than ever that it’s not Felicity in that grave. Not that I didn’t already feel that way, but to those who still needed convincing, that photo of Barry and Felicity embracing and the genuine happiness on his face to be reunited with one of his best friends was something that touched my heart and showed exactly why it’s absolutely not her in the grave. 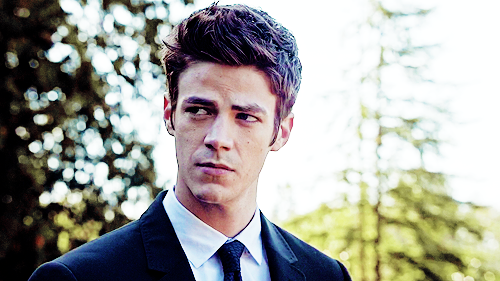 When I think back to that scene at the grave – which is permanently embedded in my brain at this point, that’s how much I’ve analyzed it – I don’t just think of Oliver’s reaction to the person in the grave (which is the first clear indicator that it’s not Felicity), I also look to Barry. Barry Allen, the fastest man alive, was late to the funeral of whoever is in that grave and looks sympathetic, not defeated. He doesn’t look like someone who has lost one of his best friends. While Barry is there at the funeral, make no mistake – Barry isn’t there for whoever’s in that grave, he’s there for Oliver. He’s there to comfort Oliver in his time of need as he says goodbye to yet another person in his life that he’s cared for. Oliver is someone who has lost too many people in his life, and like Barry saw during last year’s crossover, that’s something that has affected Oliver to his core. While Barry has certainly lost people in his life, he’s a different kind of man with different experiences, but even then he’s had his struggles coming through the other side. Barry understands Oliver, cares for him, and worries about him, which is why he comes to be a source of support for Oliver during yet another difficult time in his life. If that was Felicity in that grave, not only would Oliver not be able to physically or mentally function but Barry would not have the reaction he did. I love Barry, but we all know that he’s a crier. And every time he cries, we all start crying. One of the great things about Arrow and The Flash is the difference between the titular heroes. Oliver is more stoic, someone we don’t see let his walls down that often, but when he does it guts us to our soul. Barry, on the other hand, is someone who wears his heart on his sleeve. He feels with every bit of himself and he never tries to hide it. And every time he cries, it also tears into our soul. So, yes, Barry is a crier. And yes, if that was Felicity Smoak, one of his best friends in the world, in that grave you gosh damn bet that Barry would be a crying, uncontrollable mess. While I stand 1,000,000 percent in Camp Olicity, I’ve always loved and appreciated the relationship between Barry and Felicity. It’s a friendship that was instantaneous when Barry first made his way to then-Starling City two years ago, and it’s a connection that has sustained their friendship through those two years that have passed, as well as the miles between their respective cities. We haven’t gotten to explore their relationship as much as a lot of us would’ve liked, but that foundation is already embedded in their relationship and how the actors portray it. These were two people brought together by fate and bonded over science and their similar, bubbly personalities. They’re there for each other when they need advice or a helping hand. That kind of trust is extremely hard to find even in fictional worlds. There was never really a question about it; Barry and Felicity became fast friends whose bond has only grown with time and experience. While the two appear on different shows every week – with the occasional crossover that brings the two friends together – Felicity and Barry have a deep love and respect for each other that has me regretting that we never got to see more of that on Arrow. Don’t get me wrong, I love everything about The Flash and how it came to be, but I just wish that we’d seen more of Barry on Arrow before he moved over to Central City permanently because there was so much potential with Felicity and Barry. Hell, there was actually potential for a love triangle between Oliver, Felicity, and Barry, and trust me, I don’t like love triangles. But there was actually promise there; where a character wasn’t brought in solely as a romantic foil but had a substantial place in the plot regardless of the romantic subplot. That was the love triangle that we deserved on this show. Essentially that love triangle kind of played itself out in fast forward mode last season when Felicity visited Barry in Central City, and the two tried to give it a go romantically. But both ultimately realized that while they’re perfect for each other in every way, their hearts were both vying for another. That’s something we shoulda, woulda, coulda seen explored on Arrow, with Barry and Felicity dating while Oliver watched and suffered, kind of like the Ray Palmer storyline but it wouldn’t have made me angry like that one did. But the two came to an important understanding, which is something that Diggle said to Oliver back in “Lost Souls”: what works on paper doesn’t always work in real life. So while Barry and Felicity never officially gave it a go romantically, that bond between the both of them was still intact and only continued to grow through last year. To me, Barry and Felicity’s friendship, while we don’t see enough of it, is incredibly strong and is significant to each of them. You can tell by the way Grant Gustin and Emily Bett Rickards approach it in the seven-going-on-nine episodes that the two of them have appeared in together. There’s a deep connection there and both of them would do anything for the other. We often see that when they call on each other for help or during reunions like these where they’re just happy to see each other. When they are brought together it’s for a significant reason, and each have a profound effect on each other. It’s one of those strong, meaningful relationships that someone like me seeks and connects with on these shows that are ultimately about superheroes. Like I’ve said and will continue to say a million times over, it’s the personal aspects of these superhero shows that really connect with me, and Barry and Felicity are a reminder of those close friendships that are physically divided by miles but never divided by soul.